It’s no secret that the blow dry bar phenomenon has absolutely blown up, pun intended, over the past few years. Gone are the days when only celebs are given the privilege of walking out and about with perfect bouncing curls or an up-do worthy of an Oscar moment. Now you can pop into any old blow dry bar and get a spoofed up look. Ok, now that was a lie. You CANNOT pop into just any blow dry bar. Over the past few years I’ve tried over a dozen. New ones just keep popping up and I keep trying and hoping to bring you the latest and greatest. Some have been duds – real duds- and others so-so. When it comes to blow dry bars in London, however, I found my trusted hair buddies long ago. You may remember Hershesons was one of the first blow dry bars to open in London. They are veterans in this business of blow drys and their service definitely showcases why they have been a continued success story. The Hershesons blow dry bar offers so many options that the indecisive should probably think twice before sitting in the chair. While the blow drys take only half an hour, you may spend more time trying to pick your perfect pairing. For London Fashion Week Autumn Winter 2014, I decided to hand the hair reins over to the blow dry bar professionals at Hershesons. Every morning before my first show I visited one of the blow dry bars around London and allowed the masters to work their magic. They assessed my ensemble, the weather and my needs for the day and prepared the perfect look for what was required. It’s like having a hair concierge. I had to laugh as on the fifth day, my Mercedes-Benz driver asked me if I did this every day of the week for work. God, I only wish. That’s the dream, isn’t it? Just being able to wake up and have someone else take care of the whole dilemma? Now, onto what the crew created. 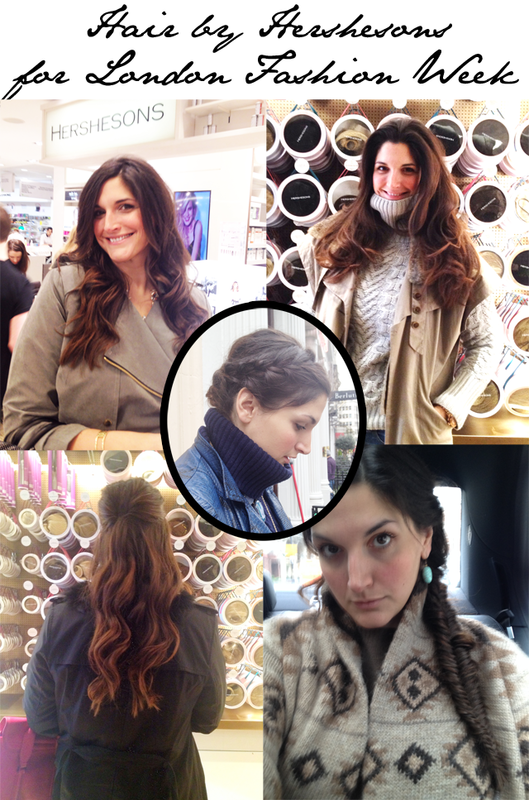 The Hershesons hair team set me up with everything from the Wavy Gravy to an oversized Fishtail Braid. We really worked the full menu. I have so much hair on this head and have always thought I should do more with hair as there are so many possibilities, so I have to admit this was more fun than anything else for me – and I learned so much about styling along the way. The Hershesons guys are always happy to hand out tips as they style your hair. Tricks of the trade are on open offer. And as they promised, each look had me in and out of the door in 30 minutes. They don’t lie when it comes to time and I made it to each morning show with about 15 minutes to spare – unheard of in the world of fashion. Now onto the competition element.